You can use the Audience report data to find out which type of audience the ad campaign has drawn, and how changes to the app affect traffic from a certain region. To build a report, you need to choose the time period, the audience segment, and the grouping type. By default, the report shows the number of active and new users over a one-week period, grouped by date. The report is formed for a specific time period. The default period is one week, but you can set the value manually. To set a range of dates, click the calendar drop-down . The selected time interval can be grouped by hours, days, weeks, or months. These types of groupings allow you to assess characteristics of the application's audience. The number of application users for the specified period. The number of new users for the specified period. The percentage of new users relative to the total number of users. The color key of metrics on the chart. Use it to show or hide a metric on the chart. Note. This item is not displayed when the data is grouped by date. The traffic source selection for the chart. 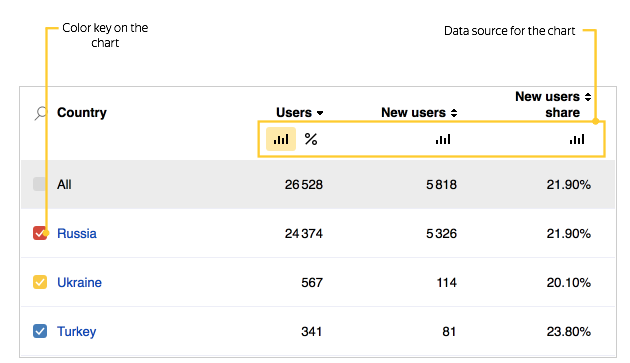 Use it to choose the metric to show on the chart: users, new users or percentage of new users.